GPM reaches $1 million milestone in giving to MDA! RICHMOND, VA— For GPM Investments, LLC, the 2017 holiday season was a time to give back and support those in need. Approximately 1,000 convenience store locations throughout the East Coast and Midwest, including Admiral, Apple Market, BreadBox, fas mart®, Jiffi Stop, Jiffy Stop, Li’l Cricket, Next Door Store, Roadrunner Markets, Scotchman®, shore stop®, Village Pantry®, and Young’s branded- stores, along with their customers, worked together to raise $169,469 for kids living with muscular dystrophy as part of the Muscular Dystrophy Association (MDA) holiday pinup campaign. Throughout GPM’s partnership with MDA, beginning in 2011, they have raised more than $1.14 million total. The 2017 holiday pinup campaign brought GPM over the $1 million mark in support of MDA’s shared mission to support people whose abilities to move have been compromised by neuromuscular disease, including everyday abilities like walking, running, hugging, talking and even breathing. Funds will help save and improve the lives of kids and adults with muscular dystrophy, ALS and related life-threatening diseases throughout the company’s store footprint. Thanks to recent major medical and scientific advancements, including the development of four new drugs that are now available treatment options, it is currently the most promising time in the history of neuromuscular disease research and medical advances ― made possible in part by the funds raised and support given over the years to the MDA Shamrocks program. 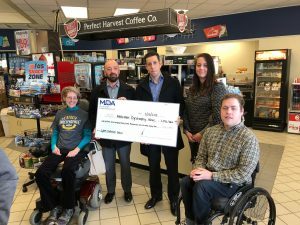 Throughout the month of December, approximately 1,000 GPM-operated convenience stores participated in the fundraiser in which customers purchased an MDA pin-up at check-out for a $1 contribution to help accelerate treatments and cures for muscle disease. Each customer who purchased a pinup received 6 coupons as GPM’s way of saying “thank you” for their customers’ generosity. All signed pinups were then prominently displayed in each store. GPM executives Arie Kotler, President and Chief Executive Officer, and Chris Giacobone, Chief Operating Officer, presented the generous check of $169,469 together at fas mart® store #1 in Richmond, Virginia to MDA Ambassadors, Karen Haley-Wingate, Joel Shaw and Allyson Elliott. To learn more about MDA, visit mda.org.